In the past 15 years there has been a substantial amount of composite decking products to hit the market. Some of the more popular are Trex, Azek, and TimberTech. Composite decking is a mixture of recycled plastic and wood fibers. They were designed initially to be maintenance free with no need for cleaning and or an application of a sealer/wood stain. The industry has since changed from "maintenance free" to" "low maintenance" due to the many issues with mold and mildew. There have been class action lawsuits from this but the fact remains that there is no such thing as "maintenance free" when it comes to horizontal exterior surfaces. It does not matter what the substrate is, all will need periodic cleaning and or sealer. The question is how should I maintain my Trex or Composite Deck so that it looks good continuously? Well it is an fairly easy process and should be done whenever the mold/mildew becomes noticeable. Failure to clean ASAP could result in the mold spores never coming clean! We do not suggest bleach for cleaning composite wood. While it does help remove the mold and mildew, it can lighten the wood fibers of the wood in the decking, bleaching out the color. It is best to use a composite deck cleaner that contains sodium percarbonate as the main ingredient. Sodium Percarbonate is registered by the EPA as a mold and mildew remover. It is a very effective chemical and is essentially harmless when it comes in contact with humans and vegetation. Clean off decking and remove all furniture 20+ feet away from decking. Use either the Defy Wood Cleaner or the Restore-A-Deck products. Both contain sodium percarbonate and additional surfactants that aid the process of cleaning exterior wood and decking. Both are powdered concentrates. Mix cleaner in a bucket with water. Warm water if possible will work better. Follow the directions as to how much cleaner you should add per gallon of water. Apply the cleaner with a pump sprayer or scrub bush. We suggest doing sections of 100-200 square feet at a time. Using a scrub brush or pressure washer, lightly wash off cleaner, dirt, grime, mold, mildew, and algae. Repeat if needed. 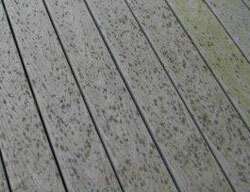 When done thoroughly rinse all decking, house and vegetation. Optional: Application of a clear water repellent will minimize the mold growth. It is a very easy step. We suggest the SuperSeal-M Water Repellent. It applies with pump sprayer and will not change the appearance at all once dried. *Update: Another popular option for protection is the Defy Extreme Clear. This product offers even better protection as it contains "zinc oxide". Zinc oxide combats the growth of mold and mildew. In addtion the Defy Extreme Clear will "enhance" the color of the composite wood just slightly, restoring some color back into faded composite wood decking. Keeping up with the cleaning of your composite deck is essential! It will keep the wood looking better and is healthier choice for people who have allergies. Sorry but no, composite sealers will not restore the original color. My composite deck has been painted. I would prefer a stain. Some of the paint is peeling off. Do I have to sand all the paint off before staining it? You would have to remove the paint fully but I do not believe you can sand composites and a stain stripper will not remove a paint. I read your older articles... AFTER powerwashing my trex front porch. The articles are older now and I'm hoping there might be something on the market that can refresh the finish... Desperate in Colorado. Please help! Yes you would want the Defy Composite Sealer for this. It is an improved version of the Extreme, formulated for composite wood. Thanks for your article on Composite Deck Maintenance. Question… Saw your recommendation to use Defy Extreme Clear on a composite deck. When I go to research the product it does not seem that Defy recommends it for composite. It just talks about wood. Can it be used on composite. I’m looking to enhance the color of my composite deck where it has faded. Would there DEFY Composite Deck Waterproofing Sealer do the same thing. Sorry but no idea as to how to remove this. I would contact Behr for some help. The stain is Behr Premium wood coatings. Semi transparent weather proofing all-in-one wood stain and sealer. Tint base 5077. Any suggestions appreciated. Depends on the stain brand and type of stain that it is. Maybe a deck stain stripper but it is iffy. A contractor was staining the wooden pergola that is over our deck and dripped the dark brown wood stain all over it. Is there anything that will remove these drips? I am sorry but we do not sell anything that will help in this scenario. I would contact the manufacturer of the Trex for some help. Thomas, we have sealers that help prevent mold but no coating will restore the lost color or finish that the Axek originally had. I have a Azek deck and I need something to clean it real clean and I would like to restore it back to it color, now it has a white sheen on it and it look duel no shine. I have used Deck Max it lasted 3 month and know it gone. I clean the Deck with there cleaner and install Deck Max revitalize on my deck just like the internet said by Deck Max. Sir,MaMa, will you please help me to get the Deck looking like it should. Defy Extreme or the Defy Composite Sealer will not enhance the color as if wet with water or darken the appearance. They will not remove stains either. We do not have anything that will darken the TREX. I have. Tre x d elks get a lot of sun and h a ve faded considerably how. Can I restore th e look so it looks better? Sorry but that is not possible to fix. We have a 6 month old composite deck and some olive oil was dripped on it. I used an on line "home remedy" of baking soda and vinegar to remove the spots but it also faded the color of the decking where I applied the mixture. Help! Is there something I can use to restore or brighten these lighter areas? I just feel awful that I made a bad situation even worse with this "home remedy". Thank you.